The Reverend Niemöller would have been pleased to attend a vigil at Congregation Kol Shofar, the conservative synagogue in Tiburon, on Sunday night, October 28. On the day after a gunman entered the sanctuary of the Tree of Life Or L’Simcha synagogue in Pittsburgh (PA), mourners clear across the country in northern California gathered in a vigil to honor the dead. 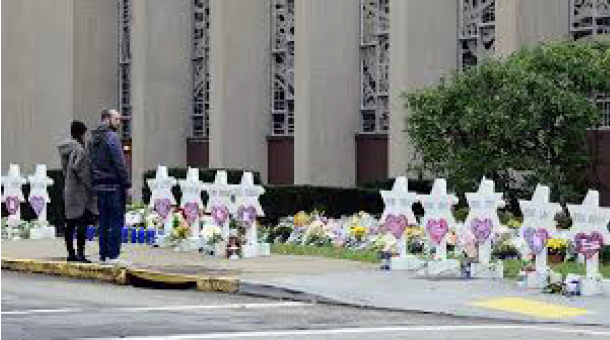 Eleven people were killed and at least six others injured (four of whom were armed police officers) in Pittsburgh. 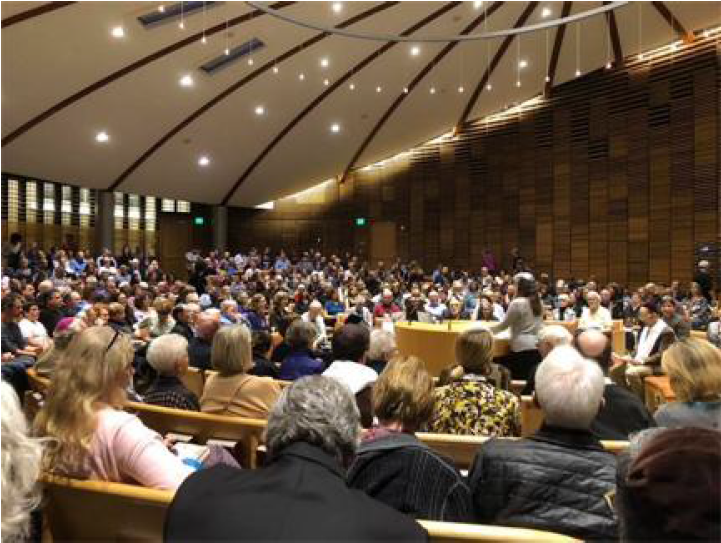 In the Tiburon synagogue alone, some 650 people came together to pray, sing, sit, and gather in solidarity. About 35 different faith communities were represented, Jewish, Protestant, Catholic, Muslim, Buddhist. The speakers were from varied traditions and stunningly inspiring. Just looking around the sanctuary — every seat taken, people lining the walls, two or three deep in some places, people sitting in the aisles. Perhaps most inspiring was the sheer power of coming together. Joe, Ellie and I were almost a mile away when traffic started getting heavy. The left turn lane for Blackfield Drive stretched beyond the traffic signal at East Strawberry Drive. As we suddenly realized that ALL the traffic on Tiburon Boulevard, eastbound and west, was heading for Kol Shofar, it reminded me of another Sunday, almost 40 years earlier. On Sunday, December 14, 1980, about 100,000 people gathered in Central Park to stand together in silence for ten minutes to remember John Lennon, who had been gunned down earlier in the week. I was a freshman in college and took the subway uptown from Greenwich Village by myself. Central Park is huge — 840 acres. As the subway roared closer to the park, I wondered which of the several stops would be the best one to get off. We pulled into a station and suddenly, everyone in my crowded subway car got off. When we stepped onto the platform, I could see that everyone on the entire train was getting off. Silently, we pushed through the turnstiles and slowly walked up the stairs to the street. Upon reaching the sidewalk, I could see throngs of people emerging from every subway station. Together from all different directions, we processed into the park and up to the area that would later be dedicated as Strawberry Fields. There is a power in being together. Even Jesus tells us that whenever two or more are gathered in his name, he is there. I did not feel like a single person in a crowd of 100,000 that chilly Sunday afternoon in NYC. I felt part of a 100,000, connected to the whole group. And in Tiburon, as we drove up to Kol Shofar, as people searched for parking and others were walking blocks to the synagogue, having parked far from the usually ample parking lot, I felt connected with all these strangers — in cars, on foot — as we drove near, and walked together, silently and unknown to each other, but somehow bonded. And in that synagogue, I was not alone in feeling bonded to the other 650 people, and to the thousands — tens of thousands — of people gathered throughout the U.S. and the world. We were gathered and bound together not only with the Jews of the Tree of Life Synagogue, not only with the Jews of Pittsburgh, or the U.S., or even worldwide, but with every Jew and every person of faith and doubt, with every believer and unbeliever. The power of gathering together is that we are reminded, , of our common bond of humanity — that just being alive makes us members of the same club, the human race. In coming together, Muslims and Jews in prayer in a synagogue, strangers from all over Marin and visitors from points all over the U.S. and the globe, it becomes easier to imagine that we really could one day turn our swords into ploughshares, and that nations could learn war no more. I urge you, if you have never been to a vigil like this one, go to the next one. It is a powerful experience. I am afraid you will have more opportunities. But one day, hopefully, our children, or our children’s children will not have the same opportunity. In the meantime, let us speak out for the socialists, the trade unionists, the Jews, and all those who are singled out, marginalized, demonized, and targeted. Let us be the one people our God made us. Here is a prayer lifted up by the Rev. Dr. Rob McClellan, pastor and head of staff at Westminster Presbyterian Church in Tiburon, at the October 28 vigil for the 11 Jews killed at the Tree of LIfe synagogue. Thank you, Dr. Rob, for letting us share this powerful prayer. How sad they must be, they who have lost touch with wisdom, whose fingers no longer recognize the texture of the bark on the tree of life and who instead grasp for the steely trigger of violence fueled by ignorance or hatred or prejudice. Heal my own ignorance and hatred and prejudice. Forgive my forgetfulness of what it requires to cooperate with the divine in building a world with love and forgive the forgetfulness of my people. As a Christian, I repent of the ways in which I have been too silent in the face of anti-Semitism, of taking advantage of being able to be in solidarity when it is convenient, of thinking too easily, “this too shall pass,” when it is, in part, my responsibility to help it pass. As a Christian, I denounce violence and I acknowledge the power of words toincite violence. I turn to the power of the word to birth new creation, and a peaceable kingdom for all. And finally, as a Christian, I remember that the one I claim to follow was born a Jew, lived a Jew, died a Jew. I do not pray as a friend of the Jewish people. As kin, as family, I pray a blessing on our gathering this night, on those from every tradition, on those who find themselves between traditions, on those who feel no connection to a formal tradition at all, that in Spirit we are made aware of connection, that our prayers mystically reach those directly affected by bloodshed in Pittsburgh, and that we are emboldened to walk side by side wherever we must go until, grasping in the dark if we must, we find once again our common wisdom. Amen.